BCM Institute offers both certification, non-certification and competency based courses which are compliant with the latest global BCM standard, the ISO 22301:2012 Societal security — Business continuity management systems. It is also inline with other standards such as the of SS 540: 2008; BS 25999; NFPA 1600, ANZ5050 and HB292. For those who are venturing into IT Disaster Recovery (IT DR), you would be pleased to note that our certification classes also addresses the requirements of the ISO/IEC 27001 – Information Security Management standards in relation to IT DR Planning. All of our courses take reference to the 7 step BCM Body of Knowledge (BoK) one goes through to implement a BCM Plan (see diagram). An e-learning series of courses are also available for BCM practitioners to gain a fundamental knowledge of BCM. Whether you are new to Business Continuity (BC), Crisis Management (CM), Crisis Communication (CC) or IT Disaster Recovery (ITDR) planning or a professional practitioner, we have a course with just the right fit for you as the courses are tailored to your level of involvement in the discipline, your job needs and your career advancement plans. All training syllabus has been designed to assist professionals in upgrading their competency using the Know, Do and Manage level of expertise. KNOW For professionals who would like to be acknowledged for their fundamental understanding of a given discipline. DO For professionals who would like to be acknowledged for their understanding and training of the intricacies and maintenance of their organisation’s plans be it for BCM, CM, CC or IT DRP. To obtain any of the disciplines’ (BCM, CM, CC or IT DRP) Specialist certification, one has to have at least 1 year of experience of the discipline of choice, pay an application fees and pass the relevant qualifying examination. MANAGE For professionals who are tasked to oversee and manage the organisation’s plans and would like to know how to implement, manage and maintain the plans. They will be given the Expert certification only upon passing the relevant qualifying Expert examination, have at least 3 years of experience and pay an application fees. Currently all our competency based courses allow participants to have the mastery to know the fundamentals of their chosen discipline and also the competency to implement (DO) an organisation plan. These courses are funded by Skillsfuture SG (SSG) allowing Singaporean and Singapore Permanent Resident (PR) to take advantage of up to SGD500 worth of funding*. At the end of the course, participants will be able to also obtain a Statement o Attainment (SOA) awarded by SSG. For those who would like to be an expert in the field, they may opt to upgrade to an international certification and obtain the Specialist or even the Expert certification of the discipline of their choice. *SGD500 funding is only available for Singaporean and Singapore PR age 40 years old and older. SGD150 is available for Singaporean and Singapore PR 39 years and younger. As the 3rd largest BCM Institute in the world, our certifications are internationally recognised. Courses leading up to these internationally recognised certificates range from the DO level of proficiency to the MANAGE level. Generally DO courses run for 2 Days while MANAGE levels run for either 2 Days (Implementer courses)* or 4 Days (Expert Implementer). Singaporeans can also look to taking advantage of CITREP funding of up to SGD2,500 for courses in the IT DRP and BCM Audit disciplines. These courses are the 4 Day DRP-5000 IT DRP Expert Implementer course and the 4 Day BCM-8530 ISO 22301 BCMS Lead Auditor course. 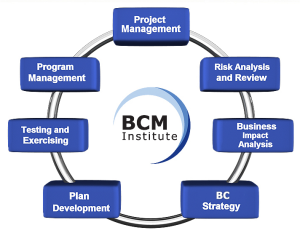 e.g those who completed the BCM-300 ISO 22301 BCMS Implementer cannot take the CM-400 Crisis Management Manager course.